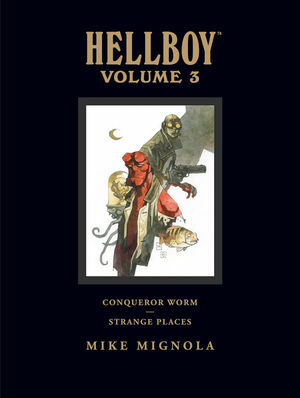 Hellboy Library Edition Volume 3 collects three pivotal stories of Hellboy's journey, as he leaves behind the world of men and journeys into the unknown: the award-winning Conqueror Worm, which brings back some of Hellboy's earliest foes, in the story that ends his career with the B.P.R.D. and marks his first run-in with the fan-favorite masked hero Lobster Johnson; the haunting fairy tale The Third Wish; and The Island, a dark and surreal glimpse into the true origin of the Right Hand of Doom and Hellboy's own destiny; along with a new, expanded sketchbook of never-before-seen Mignola artwork. * Includes over thirty pages of new sketchbook material!